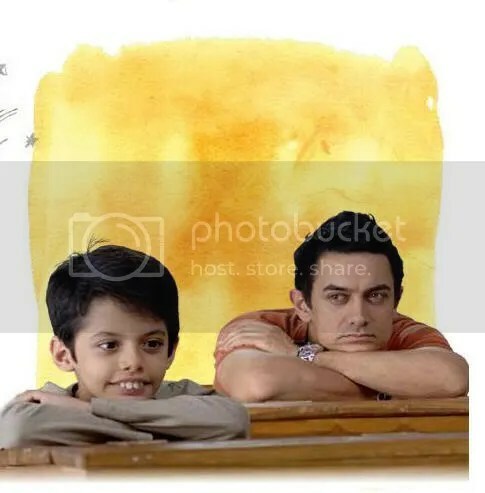 Taare Zameen Par, which means Stars on the ground, is a movie is about a gifted child who is also dyslexic. The subject is handled sensitively by Aamir Khan, who is both producer and director. He manages to get an amazing performance out of Darsheel Safary, who acts as eight year old Ishaan Awasthi. I still can’t get over that kid’s acting performance…I have never seen a child act so brilliantly. And considering that the boy was present in almost every frame, the fact that he acted so well went a long way in making the film as brilliant as it is. The movie is a little slow in the first half, but it’s a treat to watch the director take us into the world of children. One doesn’t have to be a dyslexic or have a dyslexic child to identify with the world that is created…a world of imagination, of colours and that of innocent wonder at the joys of nature. Surely all of us remember staring in fascination at fish swimming in a fish tank or at birds feeding their young? And each one of us has spent hours near water, trying to make paper boats float! We have all stared out of classrooms at birds and trees or doodled on pieces of paper while teachers droned on…well, I have! If the pace is a little slow, well, I think it was right for the subject. What made the first half all the more poignant was that Ishaan is a child rejected not only by his peers and his teachers, but also by his father…and his world of imagination, of colour, is all that he has to cling on to. He has his mother too. Tisca Chopra plays his mother Maya, who understands him but is helpless in the face of a demanding, authoritarian father (played by Vipin Sharma). These two characters (of the parents) seemed stereotypical to me. What I really liked about this movie is that the subject is not restricted to just a dyslexic child struggling with his writing and reading, but also talks about the struggle of a child against the rigors of a school system which pounces on every little mistake and humiliates the child for making it. A system which is rote oriented and stifles original thinking. When little Ishaan explains the meaning of a poem in an abstract fashion, in pure ideas, his teacher gets enraged, thinking that Ishaan is talking nonsense. Even the Art teacher insists that the children draw Still Life and is himself incapable of using his imagination. Well, this is how Art is ‘taught’ in Indian schools. It’s not just rote, but the continuous emphasis on marks by both teachers and parents that is brought out in the movie. Worse, if one doesn’t perform…or is naughty, then corporal punishment is waiting! The harsh reality of Indian school life. Children who fall in line (Ishaan’s elder brother is shown as a stark contrast to Ishaan) and get good marks are rewarded and are seen to be winners in the game of life. You don’t get to see Aamir in the first half. In fact a little five year girl sitting in front of us, kept asking her parents when Aamir Khan was going to put in an appearance, so I wasn’t the only one! Aamir arrives in the last scene just before intermission. He plays an art teacher, Nikhubh Sir. Aamir I realised with a start, doesn’t look young anymore. As to how he plays his role as a teacher, well, he certainly looks old enough, but he doesn’t look like a teacher at all…in fact even the way he talks seems artificial. I think he should have paid more attention to this aspect … but well, it mattered less as the show was all Ishaan’s. And ofcourse of Aamir’s as well – as a director. In the second half, we see a lot of Aamir, at a boarding school where Ishaan has been banished as a punishment for being ‘lazy’ and ‘dumb.’ We immediately know that there is hope for little Ishaan. If we had shed tears earlier, now there are reasons to smile. From here on the movie moves much faster and sad little Ishaan, traumatized by his separation from his family, starts to come out of his shell. It’s interesting to see how Aamir tries to help Ishaan….and also holds up a mirror to Ishaan’s father who is under the illusion that that he has loved, helped and supported Ishaan. The music is by Shankar-Ehsaan-Loy and you can download the songs (and get the lyrics as well) here at the movie site. The song Taare Zameen Par is the best. The music is present almost throughout the film, as a kind of background and I think it’s overdone. I always like to see a movie right till the end, even when the credits are being shown. And this one has footage of underpriviled children at the end which is heart warming to see. If you love children you will love this movie. I am sure the movie is going to walk away with awards…and kudos to Aamir the director! Although he happens to be my favorite Bollywood actor, in this movie I prefer Aamir the director. And the review cannot go without the mention of writer and creative director, Amol Gupte, who has penned a wonderful story and script. ← Which city has the coolest bus service and website? Great review. I realise that though (I think) I can write on anything, in any style, I probably couldn’t do justice to a movie review. I just don’t have it! I am waiting to see this movie. From the previews, the theme seems to be that ‘every child is special’ – what a wonderful theme! Anything positive for children will always be close to my heart (and to most people’s hearts as well). And kudos to Aamir for bringing it to the forefront.He may look older but I’m sure he’s wiser too! Axinia, Padmini, thanks. I hope the movie is released there soon as I am sure the western audience will love the movie! It’s got a universal theme. Fantastic story and a lovely review by you, Nita! I think I’m going to watch it when I find time. Very nicely written Nita. I won’t miss this movie. Thanks. I know you will love it, being a mom! Again great job by Aamir.. Nice Review.. Thanks. Will read and comment after i have watched otherwise it kills the fun. 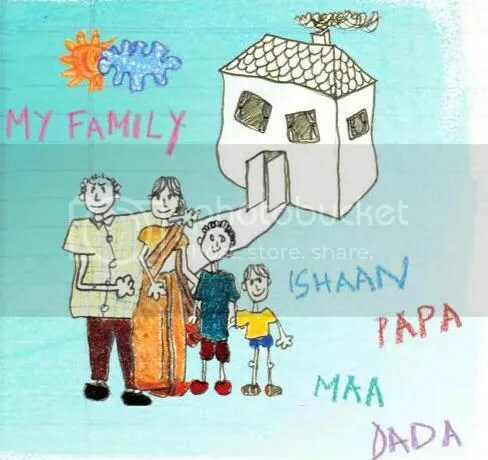 yeah its a nice movie n very much emotional too…especially that one song which plays when ishaan’s parents left him on boarding school….but the movie portrays a very negative character of parents,especially that of his father,fathers r like villan in bollywood movies these days…. THERE ‘S ONLY ONE AAMIR!!! Sahil, Poonam, Bharath, MInal, Sunil and Captain Sharks, thanks very much for your responses! A nice review I must say. Aamir Khan has a made a beautiful movie. Only twice has this happened that I have had tears in my eyes watching a movie. One was when DJ was crying on Sue’s lap in RDB and in the last scene of TZP. Ishaan’s new found confidence in the last scene is one of the best scenes of the wonderful movie. Can’t say about actor Aamir , but Darsheel Safary will walk away with all critical appreciations. It is a very good movie, I think best of year 2007. While another movie ‘Om shanti Om’ is a worst movie with no sense and concept is wery weak. Taaren Zameen Par is one of the best emotional movie’s one can watch in ones life. There are many movies that touch are minds / our intellect / our hearts …… and we call them hits ….but this is a movie that touches the soul ….. its very special …. The lyrics by Prasoon Joshi are awesome ….. i mean they are so real , so relevant to the situation and so simple ….. I would say that the emotional ride that TZP takes oone thru is actually what movies are meant for …. Salute to the actor , director , producer … gr8888 wrk done …. nice review Nita,….u definitely provided a good insight to the movie. The subtle positives and negatives u mentioned are really amazing observations. but one thing I wud lik to comment upon is Aamir not looking like a teacher. You forget that in the movie he is for the first time being appointed as the teacher in a normal school, earlier he used to teach abnormal children. That is why he behaves in such a relaxed and lenient way. And music is the SOUL of the movie. and acting performance of the boy is mind-blowing. Parenthood is something which is very close to my heart.. so should really check this one out..
Meghna, Hemant, Noopur, thanks for your responses. Hadim, I agree that Om Shanti Om is one of the worst movies of the year. Hemant, thanks. It’s not his casual approach that I meant actually. It was his acting and the ‘look’ which to a large part means his expression. Actually I have high expectations from Aamir. I have watched him play a variety of roles where he manages to get into the skin of the character, whether it’s Lagaan, Mangal Pandey, Rangeela or ghulam. Here in this movie it seemed to me that he was going through the motions of the role, not actually getting into the skin of the character. Rambler, this is the movie of the year! Don’t miss it! What you forgot to mention was the fact that very few come out of the theatre without damp eyes.This is a moving masterpiece that exudes magic. This movie is awesome.. there are many movies & they going to be hits but this movie is touches the soul.. with different story, with good songs. The kid was his acting and the ‘look’ which to a large part means his expression…. where can we see this film in the United States? Just want to say that the brilliance of the movie aside, it’s nice to see older actors portray characters their age. Om Shanti Om etc are nauseous to watch. Nice review Nita but I donot agree to most of your views which are against the movie or its cast. I have watched the movie and liked every bit of it. Stereotypical or not, both the parents acted out really well, especially the mother. She seemed too natural and deserves praise. The way Amir talks looked quite natural to me. Sorry if I sound harsh, which I donot want to, may be you haven’t heard any teacher talk like that but I would talk the same way if I cared for the children I was to teach. Amir’s talking style was as natural as the tears that fell out of the eyes of the viewers when the song Maa was playing. I donot agree that the music was overdone. Infact, the music was as superb as the movie itself. It was pure, sincere and served the movie well. I think that the whole team of Taare Zameen Par deserves a standing ovation and a lifetime achievement award! It was a brilliant endeavour and I wish such movies are made in the future as well. Thankyou very much Amol and Amir and everyone else involved for providing us such a wonderful viewing experience. Awesome movie….surely a nominee for some foreign film festivals….and a great endorsement for the artistic talents that do exist within bollywood (a stark contrast to the blockbusters produced by messers yash chopra, karan jphar and co). Btw, I saw Welcome just a few days before seeing TZP….and what a contrast…..altho welcome was entertaining too in its own way. What I really liked abt the movie was the emphasis on the flawed indian educational and parenting phyche, the narrow minded vision of what constitutes intelligence, achievment and education, and the myopic and pedantic focus on arming kids not with true life education and a real belief in themselves, but just tangible skills for coping with the competetive realities of middle class life. That scene where the older brother loses the tennis match….and the father visibly displys his frustration and disappointment, to the point of making his son feel like he really did “lose”the game (or more than just a game)……all too remnicent of that defeciency in middle class parenting where parents end up focussing more on the tangible results than on motivating the individual to learn from their experiences and capitalise on their true potential. To be honest…..the scene that really did bring out the tears in me had nothing to do with the central theme of the movie…it was when aamir khan is eating in that roadside dhaba, and he sees that little poor kid, in shorts and a torn baniyan serving food……he then makes the kid sit down and have some tea with parle g biscuits…..mannnn that really did it for me…..this scene was symbolic, as it represented the true sensitivity within aamir’s character, his true empathy for kids, especially kids who get a raw deal in life…in that regard the kid waiter is no different from ishaan…one is not given any opportunity to develop the experiences and skills to lead a rewarding life….and the other is just not understood or empathised with enough!!!!! Phantom, yes me too liked things in the movie which did not have anything to do with the central theme, which was how dyslexic children are treated in school. I thought that the director’s approach was very holistic in that sense. I guess I am probably the most peculiar of this movies viewers. I enjoyed the first half, until Aamir Khan popped up. The “character development” was pretty good. That was the part of the movie I enjoyed the most. The rest was very forgettable. If the fact that the kid had ALL the symptoms of dyslexia wasn’t enough to take away from the movie, then its 2+ hours running time did. The “I was dyslexic hence I became a teacher for special kids” didn’t do anything for me. It seemed too forced. As for the character of Mr. Nikumbh, it is full of contradictions. On the one hand he talks about treating the kids normally, and the next he is dancing in a joker suit. I have personally met a few dyslexic kids and though some of those symptoms exist, they are far more normal than the movie portrays. The teacher only patronizes the kids in the movie, and as far as I am concerned, it is just a tear jerker. All I can say is, I hope this isn’t our Oscar contention. We will go the Lagaan way again. I just realised one more factual error made in the movie. The kid has a simple maths problem, 5 x 9 or something like that… and he sees planets crashing and writes down 9. Firstly, dyslexics aren’t bad at maths. They suffer with word problems, but not because of their inability to do maths. Secondly, that is a rip-off. It is straight out of Calvin and Hobbes. This movie is extraordinary. What a screenplay? Kudos to Aamir and not but not least… Ishaan Awasti ( Darsheel Safary) who made the movie into a mega hit. What an expression and what an acting….???? .. I can’t control my tears… Itz amazing. I have watched this movie 7 times with in two days. Songs are excellent. Now I am a fan of Ishaan Awasthi. I am sure this movie will walk over with all the awards. Vasan, the boy’s real name is Darsheel, Ishaan is his screen name. – Nita. the less u act the more real u r……………. I’m cambodia girl. After I had watched this movie inspire me to search some its picture. this movie is so fantastic because it’s educated movie. I love it so much because it teach me how I should apply in my being, career. And it plant a common goal in my life to be a good teacher and menter to help children in the color world. thanks your trying the best for this world. really heart-touching movie. thanks for sharing the beauty from this merciless world. really enjoy watching it. great job, Aamir Khan! It s worlds everlasting, powerful,marveles movie . Ameer khan yhankeyu so much, i love u ishan…….. Please try to. Put positive ideas in your review. The movie was good in all aspects. Its musis was all amazing and heart touching.